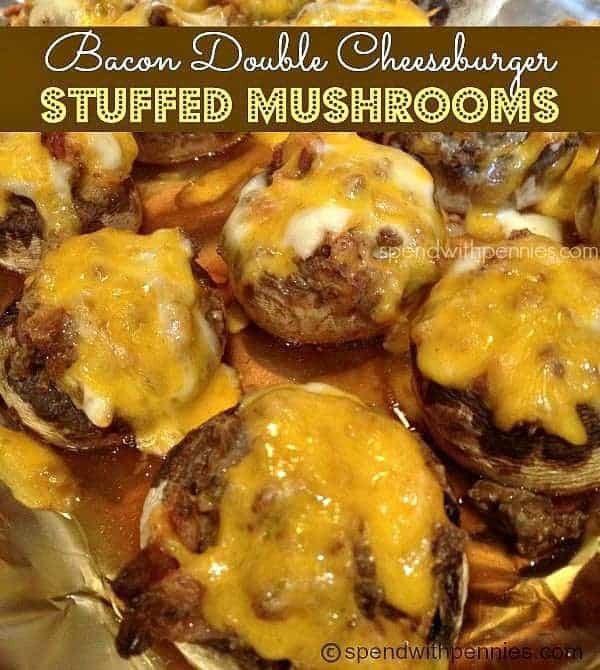 This Bacon Double Cheeseburger Stuffed Mushrooms Recipe is one of our all time favorites! Juicy mushrooms stuffed a seasoned beef and bacon filling, topped with cheese and baked until hot & bubbly. 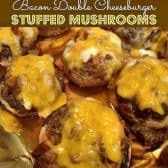 Bacon Double Cheeseburger Stuffed Mushrooms are hands down my favorite stuffed mushroom recipe! 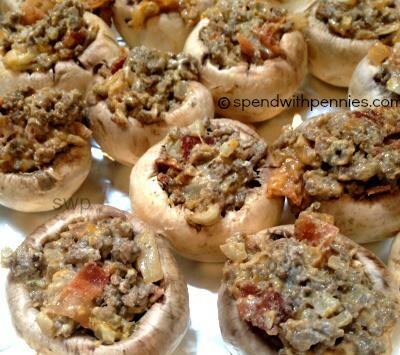 Mushrooms really do make a great appetizer because they can be stuffed with anything from salsa to your favorite pizza toppings and of course in this recipe seasoned beef and bacon! I had a hankering for a cheeseburger… but I had some mushrooms that need to be eaten. I absolutely love mushrooms on my burgers so I knew this would be delicious and I was right! 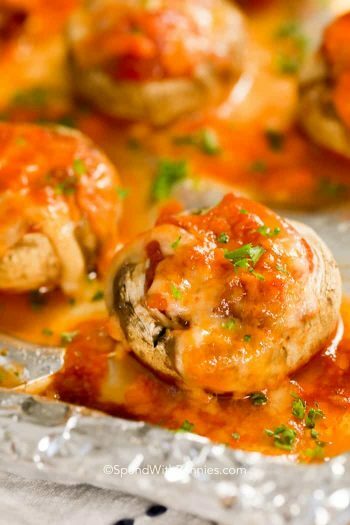 Juicy mushrooms stuffed a a seasoned beef and bacon filling, topped with cheese and baked until hot & bubbly. I use a large white mushroom but you can use any kind of mushroom making these the perfect snack or meal. Pile the filling high on a portobello and top it with your favorite cheeses for a quick and easy weeknight meal! When filling the mushrooms, pile the beef mixture really high and top with cheese! This stuffed mushrooms recipe is definitely not like most you’ll find, but it is quite possibly the best! It’s easy to make, and what is better than cheese with bacon?! Note: This recipe makes 15 med-large mushrooms… it can easily be doubled to feed a crowd! Enjoy! Cook bacon until crisp, drain on paper towels, crumble & set aside. In a pan, brown ground beef, onion & garlic powder until beef is cooked through. Drain any remaining juices. Meanwhile, pull the core out of the mushrooms & discard… I use my strawberry/tomato huller to scrape out a little bit more of the mushrooms. Stir cream cheese into the beef until melted. Add ketchup, mustard, 1/4 cup cheddar cheese, Worcestershire sauce, crumbled bacon and stir until combined. On a foil lined pan, fill each mushroom with the beef mixture. Don’t be afraid to pile it up high… it’s yummy! Top with remaining cheese and bake 20 minutes or until cheese is melted and mushrooms are cooked. 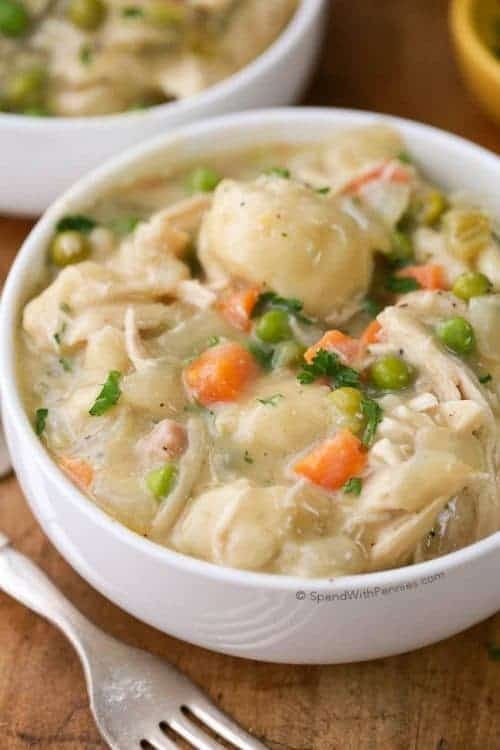 I love this recipe, but both times I’ve made it, it took longer than 10 min. to prepare. 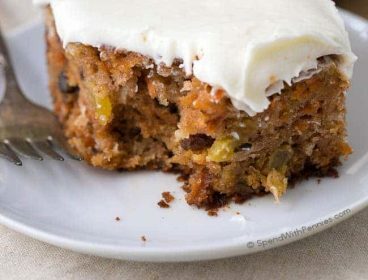 I am disabled and looking for recipes I can easily make without having to stand for a long period of time. Thank you for what I have seen already. 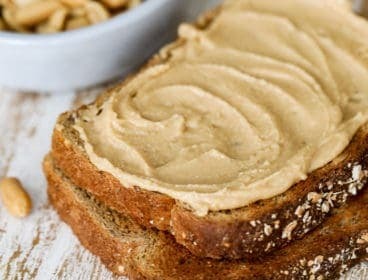 They look sooo easy to prepare and serve. Hi LisaJo, I hope you find many recipes that you want to make! 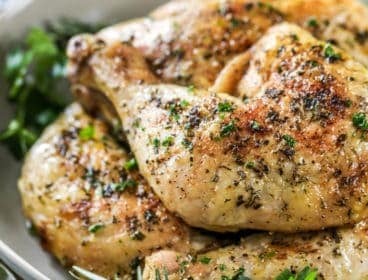 Your recipes look fabulous! 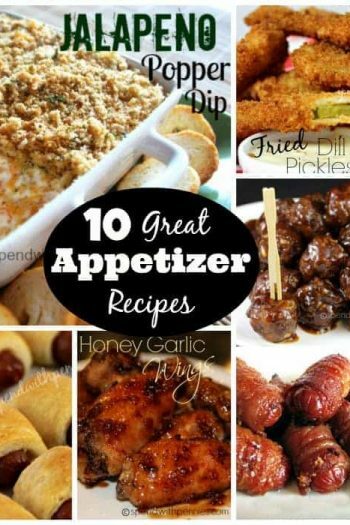 I am a single mom of a 17 yr old daughter and she loves appetizers for dinner..cannot wait to try some of these! I do something similar to this, but I do not discard the stems. Grind them up in a small food processor and add to the meat mixture. Adds flavor and bulk. I chop up the mushroom stems and use them in the stuffing. 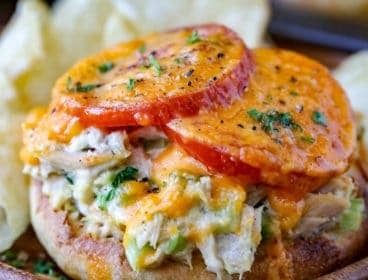 Also use cream cheese, canned crab meat instead of beef. Parmesan cheese, cheddar or whatever I have at the time. yummy. I will have to try the ground beef ones. Love the crab ones too, always so good! Great idea! I bet that would be delicious! Instead of wasting the mushroom cores, chop them finely and add to meat mixture. Instead of discarding the mushroom stems, I chop mine and put them in with the hamburger mixture. Wow! 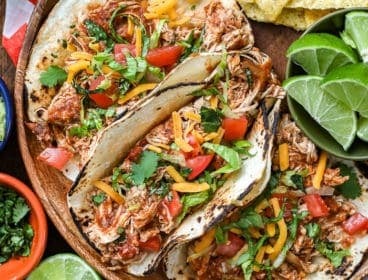 These sound amazing and a recipe we will definitely be keeping. We’ve shared this with all our social networks because it’s just too good not to share. 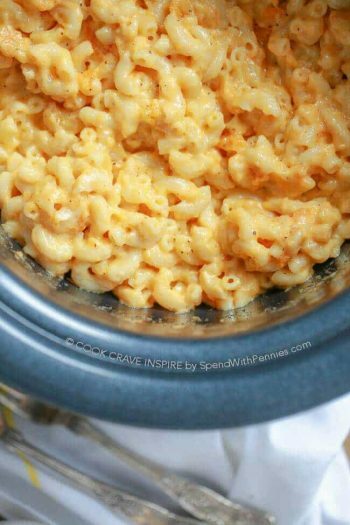 My mouth is watering just reading about this recipe. I’ll fix these tomorrow night for my truck driving son. We all love mushrooms. Thanks. 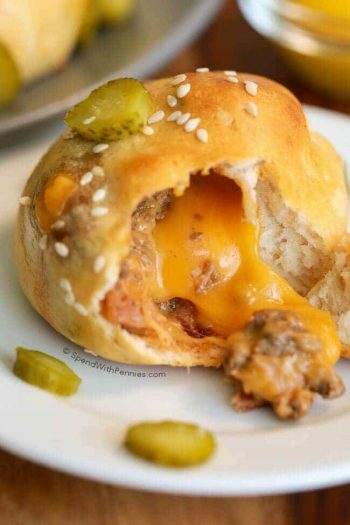 This is very similar to a dish my grandmother made when I was a little girl, and I made it for my kids, and now for my grandkids… Cheeseburger pie. We’d brown the ground beef in a little water to help pull out any additional fat and grease, then drain, add chopped onions & bell peppers, mushrooms, ketchup, mustard, a shake of worcestershire, a tbl spn of sugar, and let it simmer for about 20 minutes. In the meantime, take out a frozen deep dish pie shell, brush with a little egg yolk and slide into the oven to brown. 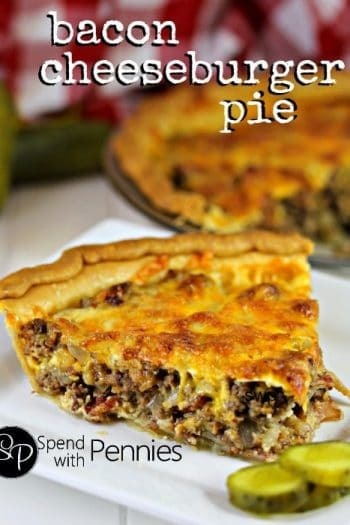 Once lightly brown, pull the pie crust out of the oven, grate enough medium cheddar cheese just to cover the crust, then spoon in the hamburger mixture into the pie crust and cover with remaining grated medium cheddar cheese (generously) and bake at 350 for about 15 minutes to melt cheese sufficiently. Pull from the oven and cool. Cut and serve. It’s a family pleaser. That sounds absolutely wonderful! I”m going to give it a try! Fixed your recipe tonght and it is def a keeper. Very delicious. OH MY HECK!!! These look amazing!!! They work as vegetarian as well. I used a can of rinsed white kidney beans. I used Dayia Cream cheese. No other cheese or bacon. I mashed the beans. Used it as a filling as as a dip. 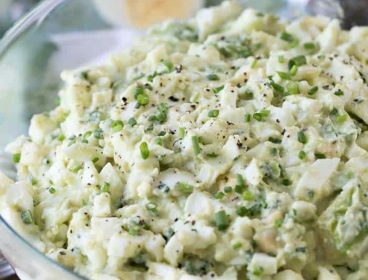 Put chopped Dill Pickles on the dip. It was tasty.